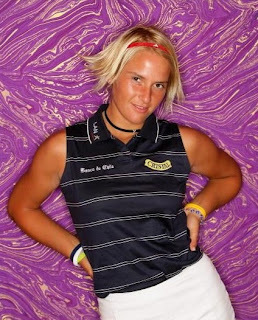 Nicole Perrot, from Chile, had a great rookie year on the LPGA Tour in 2005, winning once and finishing just outside the Top 30 on the money list. Unfortunately, she's slipped a little since then, falling back to 107th on the money list last year. She's made five of seven cuts so far this year and at the time of this writing stands 101 on the money list. The falloff is easy to trace in Perrot's stats. 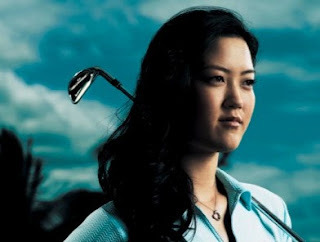 In her fine 2005 season, she ranked 31st in sand saves, 46th in greens in regulation, and 87th in putts per GIR. In 2007, she ranks 163rd, 90th and 138th, respectively, in those categories. Also in 2005, Perrot was 57th in driving distance, this year she's 136 (she's actually lost about 8 yards off the tee in the past two years). 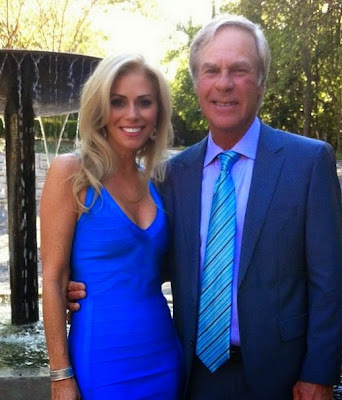 Julie Crenshaw, wife of Hall of Famer Ben Crenshaw. This photo appeared in Sports Illustrated around ... 10, maybe even 15, years ago ... as part of that magazine's swimsuit issue. Bettina Hauert is a German playing on the Ladies European Tour who won her first LET title on Sunday in the Ladies Swiss Open. She birdied seven holes in a role to do it, too - the last three holes of regulation to get into a playoff, then every hole of the 4-hole playoff. 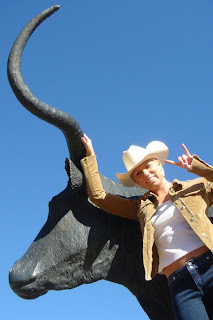 She beat two Golf Babes favorites, Anna Rawson and Paula Marti, in the playoff. From one of her Nike catalog shoots. 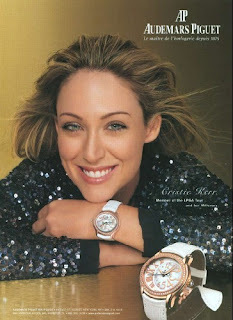 From a print advertisement that Paula Creamer recently did for Citizen Eco-Drive watches. Interesting that she's not actually wearing a watch in the photo. I'm becoming quite the fan of Jee Young Lee. The young Korean is major-league cute, and just look at that smile and try not to smile yourself. Plus, I'm a sucker for the Rubenesque. But I'm also a big fan of her game. This 21-year-old is one to keep your eye on if you're an LPGA fan. She's got length that only a few other women in the world possess. She's currently third on the LPGA in driving distance, one of just six women average more than 270 yards. She finished fourth on that list in 2006 with a 275.1-yard average. She won as a 19-year-old in the LPGA-sanctioned CJ 9 Bridges tournament in Korea, which is what got her onto the LPGA Tour. She's come close a couple times since then, including last week when her weakness - putting - cost her dearly in a playoff against Suzann Pettersen. 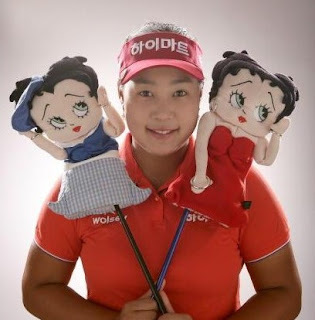 She has improved her putting greatly over the past couple years, however, and as her short game matures I think you'll see Jee Young Lee winning, and winning often. 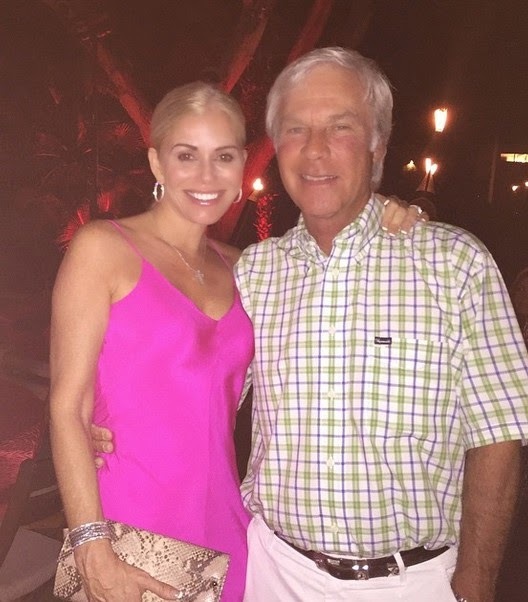 And like many of the Korean players on the LPGA Tour, Lee is a big supporter of charities. She gave $10,000 to the LPGA-USGA Girls Golf program earlier this year. Great week for Golf Babes at the Ladies Tenerife Open on the Ladies European Tour, so we'll celebrate by reposting a few of our favorite photos of the golfers in question. Virginia athletics director Craig Littlepage announced today that Kim Lewellen has been named the Cavaliers new women's golf coach. 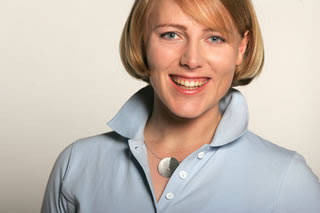 She succeeds Jan Mann who announced her retirement in February. Mann directed the program for its first four seasons, including berths to NCAA Regional Championships the past three years and a 13th-place finish at the 2005 NCAA Championships. Lewellen comes to Virginia after spending the past two seasons as the head women's coach at East Carolina. She led the Pirates to the program's first ever Conference USA Championship in 2006 and a runner-up finish this season. Her 2006 squad qualified for the NCAA East Regional, the third time a team from ECU had reached NCAA postseason play. This year's Pirate squad qualified an individual competitor for the NCAA East Regional. Before taking over the program at East Carolina, Lewellen served as both the head men's and women's coach at The Citadel for the 2003-04 season.